EPA To Unveil Stricter Rules For Power Plants The rules, which come two decades after Congress ordered the agency to regulate toxic air pollution, would give power plants nationwide just three more years to slash mercury and other harmful emissions. But some big power plants are angling for more time. Piles of coal are shown at NRG Energy's W.A. Parish Electric Generating Station in Thompsons, Texas. 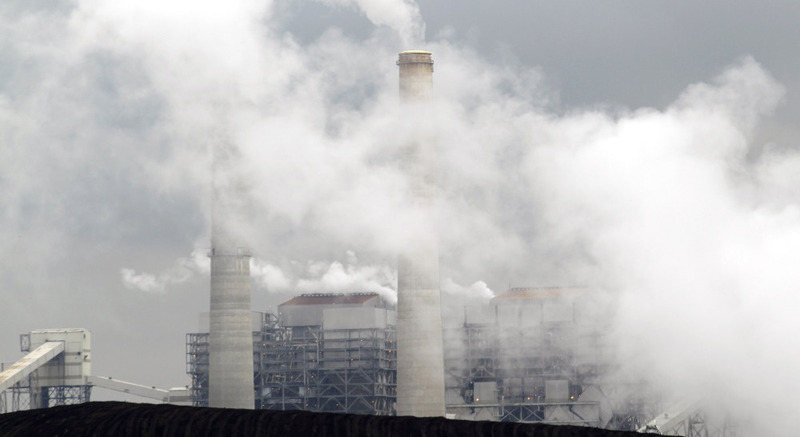 The U.S. Environmental Protection Agency will begin regulating mercury emissions from coal-fired power plants for the first time. More than 20 years ago, Congress ordered the Environmental Protection Agency to regulate toxic air pollution. It's done that for most industries, but not the biggest polluters — coal and oil-burning power plants. The EPA now plans to change that later this week, by setting new rules to limit mercury and other harmful pollution from power plants. When Congress first told the EPA to regulate toxic air pollution in 1990, pediatrician Lynn Goldman was investigating the impact of mercury from mining operations on Native American families living near a contaminated lake. "We had children that had levels that were many times higher than levels that are considered to be safe," Goldman says. Their families caught and ate a lot of local fish, and Goldman says she had to advise them to stop. The fish had too much mercury. Goldman, now dean of George Washington University's school of public health, says mercury damages children's developing brains, impairing their verbal ability. Mercury from mine tailings, medical waste and especially air pollution adds up. It accumulates in the food chain, mostly in fish; pregnant mothers pass it to their children. Studies suggest hundreds of thousands of babies each year are born with high mercury levels. "Children who live closest to the plants are most affected by them," Goldman says. Goldman headed the EPA's toxics office during the Clinton administration and worked on limiting mercury. It wasn't easy, and she says the power industry and its supporters resisted. "I think from day one everybody knew that regulating mercury from especially power plants wasn't going to be easy," she says. "I don't think anybody thought that today, 21 years later, we would still be in a position where this had been controlled." When President George W. Bush took office, the power industry persuaded his EPA to adopt soft limits on mercury, but federal courts said that regulation was too weak, so it never went into effect. Now, the court has set a deadline of Friday for the EPA to issue a new rule. The language the EPA wants would require quick action, stating that within three years, power plants that burn coal would have to cut more than 90 percent of the mercury from their exhaust. They'd also have to slash arsenic, acid gases and other pollutants that cause premature deaths, asthma attacks and cancer. But even now, some power companies have been furiously fighting the EPA's rule — especially its deadlines. "It's physically impossible to build the controls, the generation, the transmission and the pipelines needed in three years," says Anthony Topazi, chief operating officer for Southern Company, which provides electricity to nearly 4 million homes and hundreds of thousands of businesses in the Southeast. Topazi says electricity rates will go up, putting marginal companies out of business. He says unless his company gets six years, it will not be able to keep the lights on. "We will experience rolling blackouts or rationing power if we don't have simply the time to comply," Topazi says. Paul Allen, senior vice president of Constellation Energy, says that's not his company experience. Constellation installed controls for mercury and other pollutants on its big power plant outside Baltimore, and he says it took a little more than two years. At the peak of construction, it put 1,300 people to work as well. "We don't believe jobs will be destroyed, and we do think that it's time to get on with this work," Allen says. Allen says the power industry had plenty of warning that this was coming. About a dozen states — Massachusetts, for example — have already required power plants to clean up mercury. Ken Kimmell, the commissioner of the Massachusetts Department of Environmental Protection, says though power plants in his state have slashed mercury pollution, his department still has to advise people not to eat fish caught in streams and lakes. "The mercury levels in the fish are still too high for it to be safe to eat, and that's because we're still receiving an awful lot of mercury from upwind power plants," Kimmell says. Those upwind power plants are in other states, and Kimmell says that's why it's so important for the EPA this time to adopt strong nationwide rules with tough deadlines, despite all the political pressure it's under not to do so.